A microscope's field of view is the diameter, in mm, of what you see when looking through the microscope. The field of view can be found if you know the eyepiece magnification field number (FN) and the objective magnification. 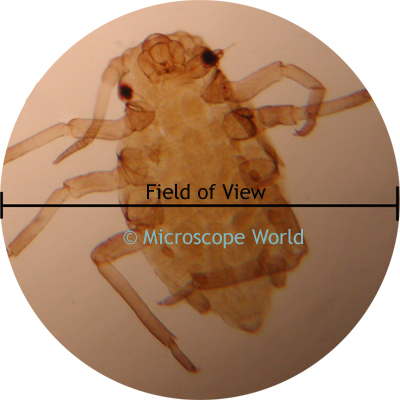 You can view complete formulas to calculate microscope field of view here. If you are using a stereo microscope with an auxiliary lens you will also need to know the magnification of this lens. Your field of view will always increase (ie you can view more of your specimen) as you decrease your magnification (or "zoom out" when using a stereo microscope). As you increase magnification, the field of view gets much smaller.